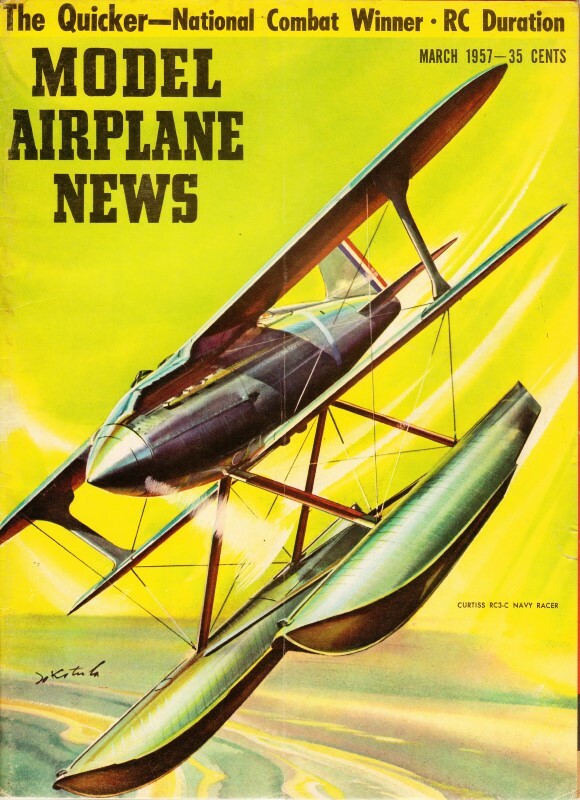 Four new imported model airplane engines - three diesel and one glow fuel - are extensively reviewed in this 1957 issue of Model Airplanes News. All are without throttle (R/C was very new at the time). The glow fuel powered Enya 15 Model 3101 with bushed bearings arrived from Japan. A Frog 249 and Elfin diesel, both from England, incorporated twin ball bearings on the drive shaft. Finally, from Germany came the Graupner Taifun Super 21, also with a pair of ball bearings. Variety is the spice of life and, in this late round-up of new foreign-made engines, variety abounds. An authoritative analysis. This month's selection of imported motors emphasizes the widely differing approaches made by individual foreign designers to a common objective. In this case, the objective is in the category of popular multi-purpose motors of .15-.20 cu.in. displacement. Within the limits of this specification, four designers have managed to differ in their views to the extent of using three types of induction, two types of ignition, two types of main bearing and three basic types of cylinder assembly. Worthy addition to the ranks of the popular .15 glow motors is this new Japanese-made Enya. Equipped with flexible needle valve. Elfin BR 2.49 from England, has twin ball bearings, reed valve induction. Supposedly a match for any production .15's in world. In this recently introduced Japanese product, is found the nearest approach to the well-proven American layout: glow ignition, shaft induction, a plain, bushed bearing and a loop-scavenged cylinder. It adds up to what we would call a nice motor. There have been more exciting designs, but the Enya starts readily, handles easily, has plenty of power, is well built and attractive in appearance. Unlike the K.&B. and O.S. 15's, the Enya uses an integral casting for the crankcase and cylinder barrel, with separate main bearing housing, as on certain front rotary McCoy models. A drop-in liner is employed, flanged at the top, upon which is seated a deeply finned alloy head secured by four screws into the cylinder casting. No head gasket is employed. All the castings are of excellent quality. The front housing has a cast-in bronze bearing. The crankshaft is of the full disk web type with machined-in crescent counterbalance. It has a 0.355 in. diameter journal and a 1/4 in. gas passage. A long, rectangular intake port, 3/8 x 19/64 in., is featured, giving a 180-degree admission period. A light cast-iron piston with straight baffle is used, having a full floating wrist pin with aluminum end pads. The conrod is die cast with a bronze bush at the lower end. All bearings are well fitted and accurately aligned. The Enya 15 has a bore and stroke of 15 x 14 mm. (0.5905 x 0.5512 in.) giving a displacement of 2.44 c.c. or 0.151 cu.in. It weighs 4.4 oz. complete. The motor is for beam mounting but, recessed into the back of the crankcase are three lugs, center-popped ready for drilling and tapping to enable radial mounting studs to be fitted, should this be desired. The venturi is bored 7 mm., but is fitted with a reducer which cuts the choke diameter to 6 mm. This, of course, is further restricted by a spraybar type needle-valve assembly. Our test model Enya 15 was given a break-in of 2 1/2 hours. At the end of this time a slight tendency to lose power when hot still persisted and it would appear that a fairly lengthy break-in is necessary with these motors before the continuous operation potential is realized. The manufacturer's leaflet specifies a fuel containing nitrobenzene in place of the usual nitroparaffin such as nitromethane. This is on account of the difficulty in obtaining the latter in Japan and certain other countries. The Enya runs well using a nitrobenzene additive, but, of course, greater performance is realized with the use of nitromethane as commonly employed in domestic engines. Our final power tests were therefore carried out on a 50/25/25 blend of methanol, castor-oil and nitromethane. The maker's own 2-volt glow plug was used. Under these conditions, the very useful maximum output of .25 bhp was realized at approximately 13,750 rpm. Maximum torque was just over 20 oz.in, at around 9,000 rpm. Starting was very easy. All tests were carried out with the venturi restrictor in position and it is probable that slightly higher peak horsepower and rpm would be obtained with this removed. The first Elfin Diesel, of 0.11 cu.in. displacement, appeared in 1948 and revolutionized standards of diesel performance. It was followed by two more outstanding designs: the original radial-mount 2.49 (0.15 cu.in.) in 1949 and the 1.49 (0.09 cu.in.) in 1950, each of which was the top performer of its displacement group. Two years ago, another entirely new design appeared in the shape of the Elfin BR series. These, fitted with twin ball bearings and reed-valve induction, are a complete breakaway from the previous, shaft-valve, plain-bearing models and, in the BR 1.49 and 1.8 (.09 and .11 cu.in.) models, this breakaway is fully justified by performance unsurpassed by any other motor of similar size in production anywhere in the world at the present time. The BR 2.49 is a .15 cu.in. model to the same general layout. It first appeared shortly after the BR 1.49 and 1.8 were announced, but it was not entirely successful and the next twelve months or so were spent in developing the improved model now offered. This model has a bore and stroke of 0.564 x 0.600 in., giving a displacement of 0.150 cu.in. and weighs 5.25 oz. It is a compact motor with a really rugged diecast crankcase incorporating the main-bearing housing. Bearings consist of one 3/8 in. and one 1/4 in. ball journals and su­port a short full-disk web Nitralloy shaft with crescent counter-balance. The intake is placed centrally in the backplate and can be rotated for any convenient location of the needle-valve stem. Valve reeds are of copper-beryllium, two in number and similar to the Cox Thimbledrome .049 pattern. These are retained by a large diameter compression spring and a snap ring. 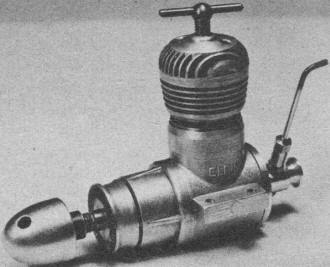 The hardened Nitralloy and features screws into the crankcase and features Arden type porting with four radial exhaust ports and four internal bypass flutes. The slide on dural cooling barrel is locked by a screw-on cylinder head cap. The motor is very easy starting to anyone familiar with Diesels. We found that mere finger-choking was the only preliminary required. 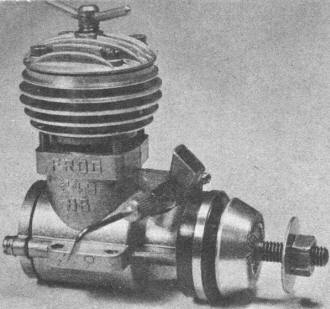 Both the needle valve and compression adjustment were responsive and the rearward position of the latter facilitated comfortable handling without the usual risk of nicking the knuckles against the rotating prop. 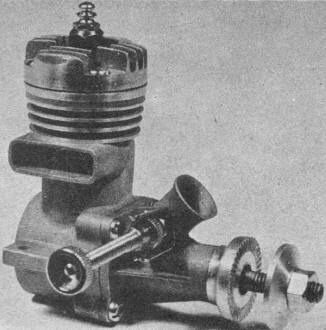 The maximum output obtained was a shade under 0.23 bhp at 13,300 rpm, Though somewhat less than the peak output of the top class contest .15's and not as high as might be expected in view of the exceptional power/displacement ratio of the BR 1.49/1.8 models, these figures are comparable with those obtainable with the average good .15. This engine, the first .15 cu.in. Frog unit of contest performance, has many interesting features. A twin ball bearing, shaft-valve motor, it has a unique synthetic rubber cap over the crankcase nose enclosing the front bearing. This serves the dual purpose of an oil seal and a protection against the ingress of grit and dirt. Two large (3/8 in. i.d.) ball journals are used, supporting a counterbalanced shaft of heat-treated nickel steel. The cylinder and porting design is, in some respects, reminiscent of the Oliver Tiger. Four radial exhaust ports are employed. These are of moderate area but placed high in the bore, resulting in an exhaust period of exceptionally long duration-approximately 170 degrees of crank angle. A 360 degree bypass passage surrounds the lower section of the cylinder liner with four steeply inclined circular ports into the combustion chamber below and between the exhaust ports. The hardened steel liner is surrounded by a generously dimensioned machine-finned barrel which is topped by a diecast head, the entire assembly being retained by four long screws into the crankcase. The liner is actually clamped at the exhaust flange, thus eliminating any undesirable radial or axial stress. Construction throughout is of excellent quality. Powerful quick-starting Diesel is the Frog 249BB. Exclusive for the American market is a special hopped-up version. Bearing seal. Taifun Super 21 from Germany. Features a disk valve and twin ball bearings. Available in limited quantities, but can turn a club. The motor has a bore and stroke of 0.581 x 0.574 in., giving a displacement of 0.152 cu.in., or 2.494 c.c., and weighs 5.75 oz. Featured is a rearwards inclined needle-valve and forward location of the mounting lugs for more balanced support. Our tests of a stock Frog 249 BB after two hours' break-in revealed an output of 0.255 bhp at some 14,600 rpm. Handling characteristics were exceptional. The motor bursts into life promptly and remains easy to hand-start even on small props allowing speeds of 15,000 rpm or so - an uncommon quality among Diesels. One essential with the 249 BB is a fuel containing not less than 3% amyl-nitrate or its equivalent, otherwise the motor will miss and spit at high speeds. This motor is a hopped-up version of the model just described and has been produced especially for the U.S. importer. It is not available in the United Kingdom. Externally, the motor is virtually identical to the stock model. 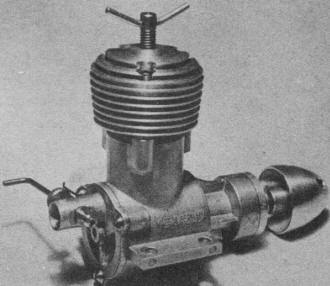 Principal modifications include a new type cylinder liner, with a specially contoured bypass and increased exhaust port area. The liner is also lowered slightly, shortening the exhaust timing and increasing the effective expansion period while slightly lengthening the sub-piston induction period. Our tests of this model indicated a marked increase in torque, especially in the region of 11-13,000 rpm and resulted in a maximum power of 0.280 bhp being delivered at 14,400 rpm. This clearly puts the Modified Frog 249 in the top performance bracket in the International .15 cu.in. class. We first had one of these 0.21 cu.in disk valve German Diesels for test late in 1953. The following year it was fitted to an 11 ft. span radio-controlled powered glider weighing over 7 lb. Lugging a 12 in. prop, it hauled this model around for flights of upwards of half-an-hour all through the summer. Not bad for an engine only just out of the A class displacement. The Super-21 is the largest Diesel offered by a U.S. importer. It has a bore and stroke a 16. x 15. mm. (0.6575 x 0.6181 in.) giving a displacement of 3.436 c.c. or 0.2097 cu.in., and weighs 6.7 oz. The power output is in excess of 0.30 bhp at 12,500/13,000 rpm. Structurally, this Taifun is soundly engineered and well finished. Diecasting is among the best seen on a foreign engine and the quality of machining is also of a high order. The main casting embodies the housings for the two ball bearings supporting the chrome-nickel steel crankshaft and the back plate, with integral intake mounted centrally above the shaft axis, carries an aluminum rotor which is driven via a dural pin inserted in the crankpin. The cast-iron piston operates in a chrome-nickel liner encased in a dural cooling barrel, the entire assembly being secured by three long screws into lug on the crankcase casting. The engine handles nicely and should give the purchaser lengthy and trouble-free service.